(Don't miss the quote from Lawrence Auster at the bottom). After the Boston bombings, Obama talked tough about finding answers to how and why this could happen, in order to "keep our people safe". But in a sickening irony, Obama himself derails the investigation before it even begins. By placing ideological blinders on the investigation, he limits its scope to only approved subject areas. 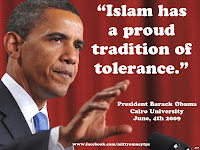 Obama fences off Islamic doctrine from discussion (consistent with his belief that Islam is a religion of peace), and reaffirms an unyielding commitment to absolute diversity, thereby guaranteeing that the investigation is biased from the start. We have enough signs that the Boston bombings were yet another attack inspired by Islamic fundamentalism, so it's sickening to see Obama's own bias preventing us from identifying the Islamic motive of terrorists. He thereby assures that (a) we never examine the doctrine of Islam (b) we do nothing to stop the spread of Islam in the West and (c) more bombs will assuredly go off in the future. Obama's bias is literally explosive. His thoughts are a homeland security threat. "If you see something, say something". I see a lethally biased president. He sounds tough, but the only thing Obama is "determined" about is his commitment to absolute diversity, not truth or safety. Confirmation bias is: "a tendency of people to favor information that confirms their beliefs or hypotheses. People display this bias when they gather or remember information selectively, or when they interpret it in a biased way". I have come here to seek a new beginning between the United States and Muslims around the world; one based upon mutual interest and mutual respect; and one based upon the truth that America and Islam are not exclusive, and need not be in competition. Instead, they overlap, and share common principles — principles of justice and progress; tolerance and the dignity of all human beings. ... As the Holy Koran tells us, "Be conscious of God and speak always the truth." That is what I will try to do — to speak the truth as best I can, humbled by the task before us, and firm in my belief that the interests we share as human beings are far more powerful than the forces that drive us apart. As a student of history, I also know civilization's debt to Islam. It was Islam — at places like Al-Azhar University — that carried the light of learning through so many centuries, paving the way for Europe's Renaissance and Enlightenment. It was innovation in Muslim communities that developed the order of algebra; our magnetic compass and tools of navigation; our mastery of pens and printing; our understanding of how disease spreads and how it can be healed. Islamic culture has given us majestic arches and soaring spires; timeless poetry and cherished music; elegant calligraphy and places of peaceful contemplation. And throughout history, Islam has demonstrated through words and deeds the possibilities of religious tolerance and racial equality. I know, too, that Islam has always been a part of America's story... And when the first Muslim-American was recently elected to Congress, he took the oath to defend our Constitution using the same Holy Koran that one of our Founding Fathers — Thomas Jefferson — kept in his personal library. So Obama thinks he is uniquely qualified to understand Islam, and has nothing but praise for its teachings. It is only mistrust that divides us, not anything to do with Islam. And he actively defends Islam from negative stereotypes. No amount of facts can penetrate his bias. Not 9/11, not the Arab Spring turning sour, not the Benghazi attack, not Major Nidal Hasan shouting "Allahu Akbar!" before opening fire at Fort Hood, not the intractable problems of anti-Semitism and attacks on Christians in the Muslim world, not the violent responses to cartoons and films, not the calls for sharia law in the West, not the campaign against free speech at the UN, not the apocalyptic and genocidal thoughts of Ahmadinejad. None of it causes Obama to question Islam. 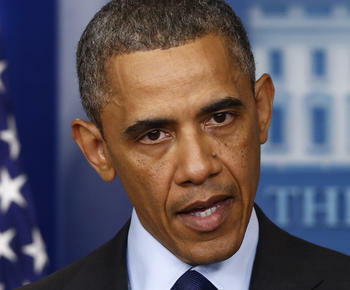 None of this makes Obama wonder: gee, why are such thoughts so persistent in the Muslim world? Nope, it's all circumstantial causes to him, nothing to do with Islam. It's big, bad America and Israel acting the aggressor. You have no doubt heard of nature versus nurture. When investigating disease, we look at both nature (genetics) and nurture (environment & lifestyle) for causes. Likewise, when searching for motives of Islamic terrorists we should be looking at both nature (Islamic doctrine) and nurture (e.g. American foreign policy). Obama, however, eliminates the nature/doctrine from debate, and permits only nurture to be investigated. Muslims are instances of a type. Where is that archetype found? In Islamic doctrine, particularly the example of Muhammad. Doctrine is the genetic code of Muslims, so we are mad if we don't study Islamic doctrine to understand the typical interpretations of Islam that define Muslim archetypes. Doctrine and beliefs. Cause and effect. Ideas have consequences. It's not rocket science. And it's not even necessary to categorically judge Islam as either peaceful or violent. The critical question is not "what is pure Islam?" but rather: is there enough material in Islam for terrorists to create a convincing argument that their version of Islam is correct? If so, then Islam needs to be treated as a dangerous ideology. There are a few dimensions to this topic that I might expand on in following posts e.g. Does Islam sanction violence? How far does the biased view of Islam pervade throughout the Obama administration? The Islamic inspiration for the Boston bombings. And a round-up of some saner voices responding to the Boston bombings. But for this post I simply want to point out that despite Obama's tough talking, if his biased view of Islam is wrong - and if Islamic doctrine does is in fact advocate violence - then it's Obama's own bias that is the greatest threat to homeland security. The late Lawrence Auster sums up our fate if the biased view of Islam prevails (via Paul Nachman). We will have terrorist attacks and threats of terrorists attacks and inconvenient and humiliating security measures and the disruption of ordinary activities FOREVER, as long as Muslims are in the West in any significant numbers. The Muslim terrorists are part and parcel of the Muslim community. According to a survey reported in the Scotsman, 24 percent of Muslims in Britain (I never describe them as “British Muslims”) believe the July 2005 London bombings were justified. Imagine that. Not only do these Muslims in Britain support terrorism against Britain, they’re not afraid to say so openly to a pollster! The unchangeable fact is that wherever there is a sizable Muslim community there will be a very large number of terror supporters and therefore—inevitably—actual terrorists as well. The enemy are among us, in America, in Britain, in the West, and will remain so until we remove them from the West and indeed from the entire non-Muslim world. As extreme as this sounds, it is a no-brainer. There is no other solution. All other responses to this problem add up to meaningless hand-wringing. The hand-wringing will go on FOREVER, along with the terrorist attacks and the threat of terrorist attacks, until we take the ONLY STEPS that can actually and permanently end the threat. File under: if you see something, say something. It's par-for-the-course for Western politicians to prostrate themselves before Islam these days. But Obama does seem to pride himself on being an expert on Islam. The guy has no humility, no self doubt, no 2nd guessing. So self assured, and yet so dangerously wrong. Obama supports the Muslim Brotherhood in Egypt, he appointed John Brennan, a Muslim convert, to Director of the CIA. Hilary Clinton's right hand woman's mother is a member of the Muslim Brotherhood. Linda, the Obama admin is certainly up to its neck in radicals. Obama would dine with the Taliban, he thinks he can reason with anybody. "We will extend a hand if you are willing to unclench your fist" he once said. That's his whole mindset, right there. He's a moron. Michael, yeah "dangerously wrong". Now's he's thinking: if only we close Guantanamo Bay the terrorists will stop bombing us. He's clueless.